With the recent canonization of our foundress and the ever increasing population of older persons, our vocation is more relevant than ever. Saint Jeanne Jugan often said, "What happiness for us, to be a Little Sister of the Poor!" We feel the same way today and we’re eager to share our joy with you. 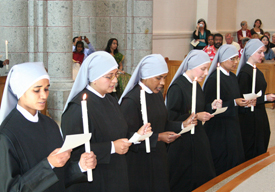 Contact Sr. Mercy at pwlsp@littlesistersofthepoor.org or call 401-723-4314. 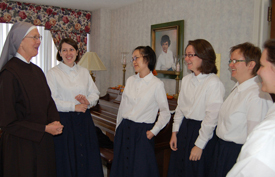 Arrange to visit us for Mass, or another moment of prayer, and a tour of Jeanne Jugan Home.